U.S. players lie on the ground as Belgium’s Axel Witsel celebrates at the end of extra time during the World Cup match between Belgium and the United States in Salvador, Brazil, on July 1. I thought it’d be fun to try to devise a way to rank the 62 World Cup matches played through Wednesday for sheer entertainment value. After all, most people in the world entered the tournament without their home country to support. And many people who live in one of the 32 nations with a contender have seen their country’s team knocked out and had to choose whether to adopt a new side to support, or to simply cheer for good, exciting soccer — or, in other words, what was absent from France-Honduras, the worst match by my measure. A match needs to matter. 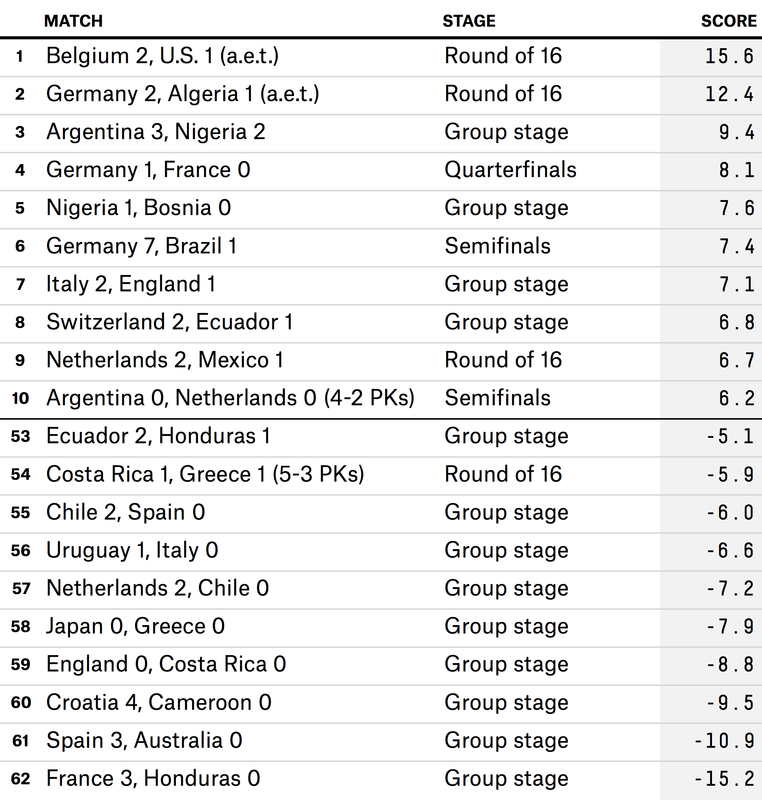 Knockout matches matter the most, while the third of the three group-stage matches sometimes matter much less, particularly when the two teams have been eliminated from the knockout stage already. A match needs to be close for most of the time. It can end 4-0, so long as it was 1-0 until the final minutes. All else equal, a match with more goals is more fun than one with fewer goals. But not all goals are created equal. Goals caused by opponent errors aren’t the result of good play, so each one is as bad as other goals are good. I prefer assisted goals, so they get a 50 percent boost. Whatever the final score, a match will be more entertaining if it has more chances. And meaningful chances matter more. So a better match will have a greater number of expected goals and assists. Our expectation is based on the location of shots and passes — and a model built by TruMedia to estimate the expected number of goals and assists based on these shots and passes and how they’re coded by Opta’s match analysts (TruMedia supplied the Opta data for this exercise). Good chances are entertaining whether or not they lead to goals: When they don’t, a defender or goalkeeper is probably partially responsible. But missed shots are no fun and a sign of bad play. So the higher the percentage of all those shots that aren’t blocked by the defense that are on target, the better. One-on-one showdowns between an offensive player and a defensive counterpart are exciting. The more of these, the better. The greater the number of completed passes, the more the ball is moving and teammates are collaborating. Incomplete passes could be the result of ambitious passing, of bad touches or of good defense, so I ignore them. Tackles are good, but missed tackles aren’t. So the higher the percentage of attempted tackles that are successful, the better. Flowing play is better than lots of referee whistles. So the fewer fouls, the fewer bookings and the fewer offsides calls, the better. There aren’t many stats that directly measure errors, so I use one of those — misplays on crosses by goalkeepers — along with own goals and goals caused by defensive errors as a proxy for sloppy play in meaningful moments. To the left are the factors I used and the weights I assigned each. Some things don’t matter in my book. I don’t take into account our prematch ratings of each team. A Bayesian would figure that the better teams are more likely to play better soccer, but in a tournament that has seen favorites dominate the later stages, I don’t want to give them any other advantages. Also, while knockout matches get a boost because they’re considered more meaningful than group-stage matches, I also don’t give any extra credit for knockout games that are tied after 90 minutes. Part of the beauty of soccer is that matches take a predictable, and brief, amount of time. So all stats are normalized to a 90-minute match, and penalty kicks don’t factor in. Relatedly, I have no bias for or against draws. Either they come in the group stage and are critical to standings, or they’re in the knockout stage and are settled by penalty kicks. I didn’t merely add together these numbers. A typical match had 725 completed passes per 90 minutes, but just 2.65 goals per 90 minutes. Plus, some of the measures were expressed in percentages. So I used standard scores, aka Z scores: the number of standard deviations each measure was from the mean. Each match’s final score was the weighted sum of Z scores for each measure. Belgium-U.S. did well across the categories. It was meaningful and close for all but the two minutes between the second Belgium goal and the lone U.S. goal. It had lots of one-on-ones, chances and expected assists; and few offsides, bookings and major errors. In other words, it was the mirror image of the dreadful France defeat of Honduras. France led comfortably for nearly all of the second half. The match had few one-on-ones, a relatively low proportion of shots that were on goal, few chances or assists, and an own goal by Noel Valladares, the Honduras goalkeeper. While I’m comfortable with both of these choices, I was surprised to see the two semis in my top 10. Germany’s rout of Brazil wasn’t competitive after the first 20 minutes, but the German attack’s efficiency and pinpoint passing made it look like a classic anyway. (It also had few fouls, bookings and offsides calls.) And it did have a certain car-wreck quality that made it highly watchable. Argentina’s penalty-kick ouster of the Netherlands was highly meaningful and close throughout, with accurate passing. 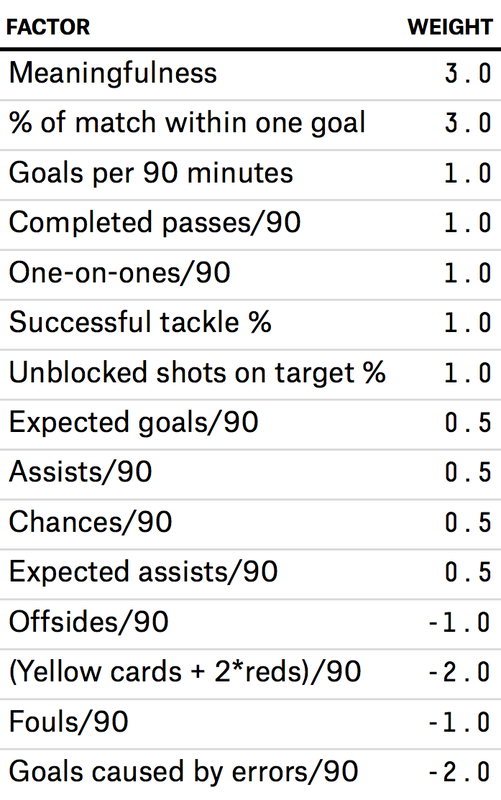 That helped it overcome the lack of goals and, especially, chances — the fewest per 90 minutes of any match so far. The rankings also make me want to watch replays of Nigeria — which had two top-five matches — and they provide a parting insult to Spain, which played two matches in the bottom 10. They also highlight the drama of the Round of 16, which had three of the top nine matches. As these examples demonstrate, this ranking, like any other, is arbitrary. The factors I included and the weights I chose were based on what data I had available and my preferences. Let me know in the comments how you’d rank the matches, or rank them yourselves. There are lots of stats available at FIFA.com and Whoscored.com.